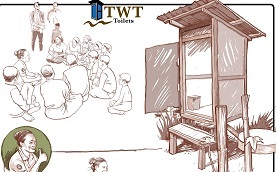 In Sittwe we have completed the construction of all our Tiger Worm Toilets (TWTs) for this project in the two different Internally Displaced People (IDP) communities (you can read more about the toilet design in our previous blogs). However, the focus of this project is not only on the construction of toilets; but on the users of those toilets and encouraging good sanitation habits. The TWTs we have constructed do not look any different from traditional pit latrines. This means that those using them do not need to ‘learn’ from scratch how to use the toilets, but they do need to understand some key dos and don’ts for using their new toilets. For example, to keep the worms alive and for the toilets to function properly, we need users to only clean toilets with water – not use cleaning products with harmful chemicals that could kill the worms. We also need to ensure no solid materials that can harm the worms – such as cigarettes – get thrown into the toilet. For some users, this requires a change in behaviour. To support this behaviour change and encourage good practice, we decided to trial a social marketing approach. 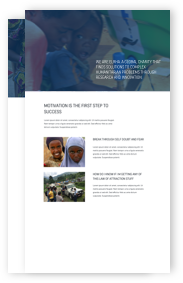 This approach uses “tools from commercial marketing to try to promote adoption of behaviour that will improve the health or well-being of the target audience or of society as a whole” (Weinreich, 1999, 3). With this method, we try to use the same techniques that many commercial companies use in marketing – by understanding the taste and needs of “customers’. In our case, this is about trying to understand the habits and preferences of the users of TWTs. By understanding what the users like and dislike, we can work out the best way to communicate with them about the proper way to use their toilets. Our first step was to meet the community and understand what they thought about their new toilets. This was achieved by conducting focus group discussions (FGDs) in the community, and also by monitoring toilet usage to discover what people liked and disliked. Likes: People liked the fact that the new toilets were good quality – they thought the structure and pits were better and more robust than their old toilets. Users told us that the new toilets were clean and comfortable, and that they liked that the toilets had less smell and required less frequent desludging. Dislikes: People did not like to hear about the worms! They were happy that the new technology meant their toilets smelt less and were cleaner, but did not really want to hear about or discuss what was in the vault. Our research also helped us to understand the practices we could encourage and the practices that we wanted to discourage when using the toilets. Once the types of practices we wanted to focus on were confirmed, we hired a graphic designer to help us come up with sketches – as they say, a picture is worth a thousand words! We briefed the designer on the things the communities said they liked and disliked, and the practices that we wanted to encourage, and he came up with four sketches for the two different communities (Muslim and Buddhist). 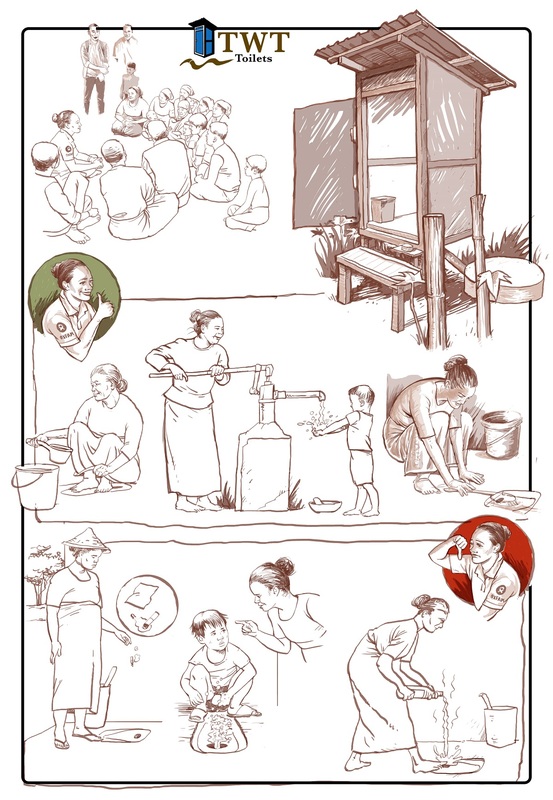 The sketches depicted people from those communities and focused on good and bad practices when using the toilets. The designer was able to communicate different messages and emotional references in his sketches. 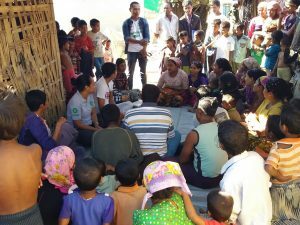 This included one focusing on community life and community strength, one focusing on the technology (sturdy latrine build) and another focusing on day-to-day life in a traditional village. Once we had the four sketches, we went back to the community to see which design they liked the most. We asked the community members to vote for their favourite. 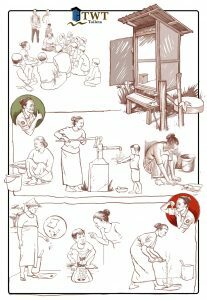 One community chose the design that was closer to their day to day life in the village, with a stress on mothers supporting their children in using the latrine and having good habits. 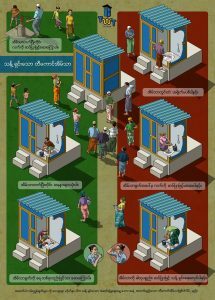 The other community chose the design focusing on the brand new aspect and technological feature of the toilet. Both communities gave interesting feedback based on their understanding of the messages from the poster, and suggested changes and improvements. We plan to turn the most popular design for each of the communities into posters as well as leaflets and stickers to display around the toilets. We hope this will help remind people about the dos and don’ts of using their Tiger Worm Toilets!